← Cat & Dog Lover Shop Update! We have been working on a thing. A big thing. 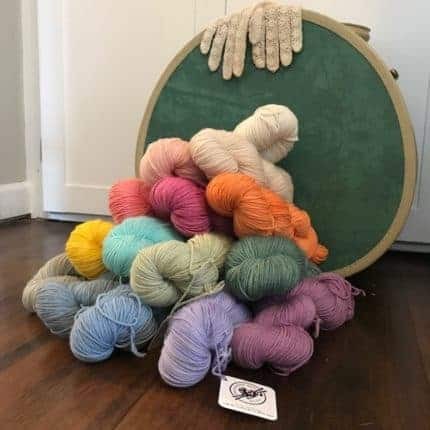 When it comes to dying yarn, nothing is more exciting than adding a new base to the yarn family. It is like having a baby, without all the cleanup. Vintage Vixen is unlike anything we have ever had at Despondent Dyes. It is our first non-Superwash base, our first sportweight, and the first yarn we have specifically designed to use in garment knitting/crocheting. Our first palette of colors includes 12 stunning colors and three neutrals. This yarn is plump and soft and works up in colorwork like it was made for it. We cannot wait to knit all the sweaters, crochet all the tops, and of course, colorwork all the mittens in this amazing yarn. The yarn officially launches April 15, but this is your special invitation to preorder, because we have a plan…. Maybe you have seen a sweet little top from Pom Pom Quarterly — the Water Clover top? Maybe you thought, gosh I would love to crochet that in a brand new sportweight from Despondent Dyes! Well guess what? Your dreams are all coming true! We are going to be hosting a crochet-along on our Instagram, Ravelry and Facebook platforms and we want you to play along! The crochet-along will start April 15, the day the sportweight yarn launches. For the next two weeks we will have pre-orders up in our webshop! You’ll get a 15% off discount on two or more preordered skeins of Vintage Vixen, just use the code CROCHETALONG at checkout!